Buy Purdeys Rejuvenate - 325ml in the UK from our online shop or directly from our independent Scottish store. A unique formula of fruit juices, spring water, natural herbal extracts and vitamins, to promote well being and provide a healthy and immediate way to feel refreshed and revived at any time. We sell real Purdeys and other Juices & Soft Drinks directly from our shop in Scotland and online throughout the UK. View more products from Purdeys. Where can you buy real Purdeys Rejuvenate safely online? If you are wondering where you can buy Purdeys Rejuvenate - 325ml safely online in the UK, then shop with us. 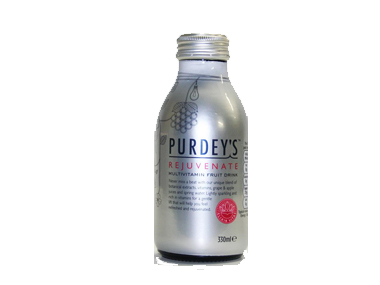 Purdeys Rejuvenate - Purdeys Rejuvenate - 325ml in Juices & Soft Drinks and Drinks.